Here's a good test for tender squid: Squeeze one end between two chopsticks, and nip off the other end with your teeth. At the longtime default dessert destination in Manhattan's Chinatown, you're welcome to what the menu board calls "exotic" flavors: they include vanilla, chocolate, strawberry, and a dozen or so others. I lean toward "regulars" like red bean and green tea (shown at top), almond cookie, black sesame, and lychee. Recently I capped off a softshell crab dinner down the block with a small cup, "fresh from the factory," of buko pandan. The former word is a Filipino term for a young coconut, whose silky-soft flesh can easily be scraped from the shell (don't confuse it, as I have, with macapuno). The latter is a family of shrubs and trees whose fragrant leaves add character and pale green color to many Southeast Asian dishes. They combine for a particularly felicitous pairing — but, like softshell crabs, you must catch buko pandan when you can. "It's good for you," the counterwoman said, surprising no one. Atop a display case bright with pastel-colored, cardamom-dusted, and foil-flecked Indian confections, a deep tray of panjeeri ($6, at $12 per pound) was the drabbest thing in sight. However, unlike many oddball foods that claim to supply men with a certain vigor, this Punjabi dish is regarded as a nutritional supplement for new mothers. Whole-wheat flour, sometimes with semolina, is fried in sugar and ghee; so too are various nuts, on occasion dried fruits, and a variety of seeds and seasonings. Ginger, for one, jumped out at me. After sampling my stash, two other guys from our lunchtime group — who already had boxes of brightly caparisoned sweets in hand — stepped back in Maharaja for some panjeeri of their own. One fellow later emailed to tell me that he loved it over yogurt in the morning; my panjeeri didn't last even that long. Previously: The countertop presented several variations on the Indian sweets called ladoo (Lah-doo, lately $7 to $8 per pound), each the size and roughly the shape of a golf ball, but with more heft. Boondi ladoo, made from chickpeas, were golden, nubbly, and a little greasy; I preferred the firmer, finer-grained besan ladoo (shown below), made from gram, or unhulled pulses — a rubric that comprises various beans and peas, as well as lentils and even lupins. Stand and deliver! Pastrami on rye with mustard ($18.45). Which slice for you? This charming hand-drawn menu of cozonaci (co-zo-Nah-chee), a family of sweet Romanian breads, depicts cross-sections of nuca, stafide, mac, rahat, simplu, and ciocolata — walnut, raisin, poppy, Turkish delight, plain, and chocolate. Of course, bakers and customers just can't cut into the loaves willy-nilly to see which is which. The intact cozonaci indicate their fillings, too, by the shape of the loaf and by decoration: One wears a single walnut, another exposes a vein of poppy seeds. Coffee and a cozonac (loaf, $8 to $10; slice, as available, $1.25) was the natural pairing for me. The menu board suggests another, however, that was enthusiastically endorsed by the counterwoman: cozonaci and wine. Previously: In aggregate, saleuri (Sal-lee-Ooh, first photo below) resemble a break-it-apart pan flute. These savory breadsticks are enriched with butter and cheese — a tangy white variety called telemea is traditional — and sprinkled with the likes of caraway, poppy, or, at Nita's, cumin. 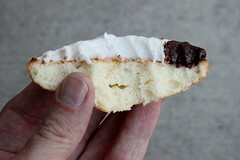 Sweeter, to various degrees, and from numerous other visits: a dense cake square packed with poppy seeds; raspberry-walnut rugelach; and a Linzer torte cookie. Also known as a Linzer sablé, this offspring of the fabled Austrian latticed cake customarily sports raspberry jam, though at Nita's apricot, hazelnut, and red currant reportedly also make appearances. At one time Taste Good's kari laksa (now $7.25), with rice noodles, bean sprouts, tofu skins, chicken, shrimp, and half an out-of-place hardboiled egg, rivaled the laksas I've slurped down in Singapore and Penang; the coconut-chili gravy was particularly lip-smacking. The bowlful shown here, however, is a laksa of years past; since a change of ownership, the gravy has fallen back a step or two. From a subsequent group dinner, the one dish I would recommend without hesitation features sizzling bean curd ($10.95) surrounding a savory pool of minced-pork sauce. The lightly fried bean curd is crispy outside, almost creamy inside. You might want a drop cloth yourself. 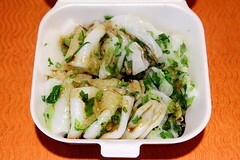 Lai cheong fun, sliced and heaped. At a glance, you might almost mistake it for a flat cupcake.